Linen canvas--what a difference. I'm spoiled now. Wow! You're so very clever. If there was a gun pointed at my head I still couldn't draw a straight line to save my life so I'm in complete awe of your talent. 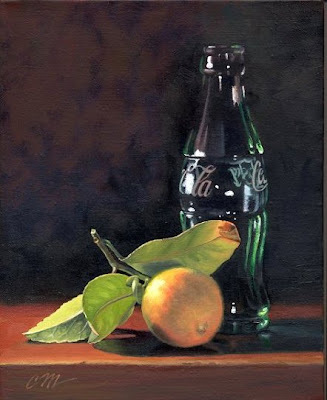 Not just your talent but also your subjects...coke and a real live lemon...it looks awesome! Thank you, Maureen. Good luck with the book. This is really eyecatching. And I want to say that you've done a really good job with the lettering on the bottle (I have painted signs for sooo many years). I have one small criticism and I may be wrong...but the lemon doesn't look as grounded as the bottle. The painting looks so good that I almost hated to bring it up but I think you would want to know that...and it could just be me. Hope I didn't overstep my bounds here. I really enjoy seeing your work. wow amazing! love your work!!!!!! Thanks Frank, Pat and Sandra--now if only someone on eBay would agree . . . I've never bid on anything on ebay and am not really sure how it works...is it currently 1 bidder at one cent? If so, that sounds kinda chintzy but I guess the object on ebay is to get stuff as cheap as you can. I may try to bid later if I can figure out how. Oh, I didn't think you meant that, Connie. It's just that this a really good painting and it's sitting there with only one cent bid on it...it just deserves more respect than that. (And I have bought my friends' books before because I liked them). Oh well--eBay is always a craps shoot, especially since I haven't shown things regularly. You have to do that for several months to build any sort of name recognition or following and have a better chance of selling. So, what happens if the bid window closes and you don't have a fair price? You don't have to take a ridiculously low bid right? That's sort of what I thought. I've never really done the ebay thing so I'm not familiar with the procedure. I guess if I was trying to buy a chain saw or something I would be trying to be as cheap as possible but this throwing pennies at a work of art kinda pisses me off. You'd think I'd be insensitive to this sort of thing by now but I guess not. Keep em coming. You're always an inspiration.